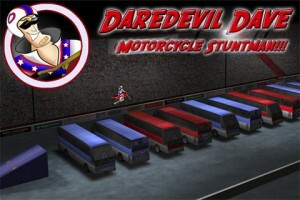 Daredevil Dave: Motorcycle Stuntman! is the inaugural release from developer M-Digital Media (aka schplurg, long time TouchArcade forum member). It places you in the role of a stuntman traveling the globe earning money by performing insanely dangerous motorcycle jumps, and looking stunningly handsome while doing so. The goal is to land each stunt in as few tries as possible, so as not to blow all your profits on expensive medical bills from crashing. It’s an entertaining blend of strategy and action wrapped in a very humorous package, and is quite impressive for being the very first game from a new indie developer. 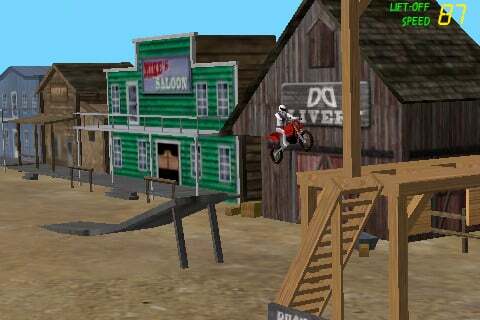 The game’s main Tour mode consists of 18 different stunt levels, unlocked one after the other. 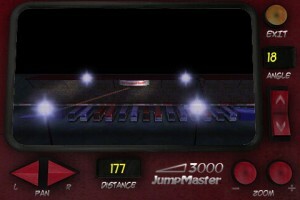 Certain elements of each stunt are randomized each time you play, such as the length of the jump or height of objects like flaming hoops. Your job is to determine the appropriate angle of the launch ramp and proper speed you must travel to land safely intact on the other side. You would think that important details like these would have been carefully calculated before attempting such deadly feats, but Dave doesn’t do things that way. He strongly believes in appearance first, safety and planning second. Thus, the task of properly negotiating him across each jump happily falls on you, the player. Each level in Daredevil Dave is incredibly imaginative in design and objective. Sure you’ll be jumping over busses, through rings of fire, and across canyons (you know, typical daredevil stuff), but there’s also more exotic challenges like a lava jump inside a volcano and launching over a tank of man-eating sharks. Figuring out the best way to land each jump takes trial and error, and thankfully there’s a Practice mode where you can try each one as many times as you wish. It’s imperative that you do so, as each failed attempt in Tour mode can be costly, but is made slightly arduous by forcing you to back out to the menu each time you want to practice. Also, scrolling through each level one by one in this mode can be a pain. However these UI issues are only a minor annoyance, and could easily be more streamlined in an update. Upon starting a level, you’re shown a zoomed out side-view of the area where the stunt takes place. Here you can see what components make up the jump, the distance between the starting and ending ramps, and adjust the launch ramp angle. Once you’ve scoped out the scene to get an idea of what you’re supposed to do, and have set your ramp incline, you exit this screen into a first-person view of Dave on his motorcycle, complete with handlebars and a speedometer. 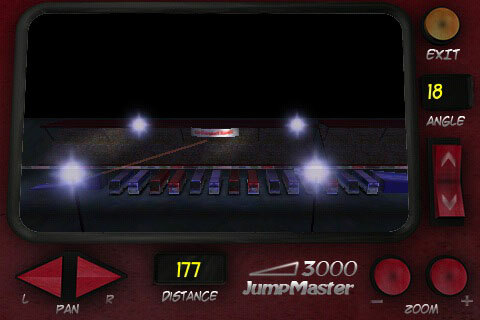 Dragging an onscreen throttle accelerates you towards the launching ramp, but no steering is required. There are also a couple of options if you prefer having a different angle on the action, but unfortunately there’s no replay function for reliving particularly memorable moments. Successfully landing a jump is a satisfying feeling, but at the same time it’s even more satisfying to spectacularly crash and burn in a failed attempt. Luckily the developer realizes this, and once you’ve beaten all 18 levels of the Tour you unlock Injury mode. This is basically the opposite of Tour mode as you try to purposely crash Dave in the most elaborate way possible, with your score being based on how large of a hospital bill you can rack up. Dave can be lit on fire, chopped up in helicopter blades, run over by freeway traffic, attacked by sharks, and more. Put simply, crashing is a blast, and if you like games like Stair Dismount or Max Injury there’s a lot of that same type appeal in Daredevil Dave. The core of the game is a trial and error trajectory game, but there’s so much personality and creativity in this game it’s hard not to like it. Between the humorous dialogue, Dave’s Duke Nuke’Em style one-liners, and the brutally painful looking bails, I was grinning the entire time I played. The gameplay is fun and well-suited to the iPhone, and there’s a good amount of challenging content. There’s a few rough-around the edges aspects to it but at it’s $0.99 sale price, it’s still a bargain for the amount of entertainment. Don’t feel bad if you find yourself purposely steering Dave into the shark tank for your own sadistic pleasure – I do that too.